We have all grown accustomed to seeing new forms of payment pop up every day. Cash is used less and less. To be “with the times” now requires making payments electronically, and invisibly. Actual tangible objects, such as coins or bills, are exchanged less and less. Instead, electrons silently move funds from one account to another. Payment is still made, but the way in which it is done has changed dramatically. This blog entry deals with a form of payment that is quite different from what we would consider normal in the Western world. How would you feel about making payments with stone money? The inhabitants of the island of Yap do exactly that: they pay with stones. They also use shells as currency. Each one of these forms of payment has one thing in common: the exchange medium represents something rare, or something that requires hard work to obtain, thus making it valuable. We will start out this blog by finding where in the world Yap is located. Then we will see how the Yapese made their stone money, and where they went to get the stone (you will be surprised). Finally, we will answer the question: is this still used today, or is it ancient history? Federated States of Micronesia. 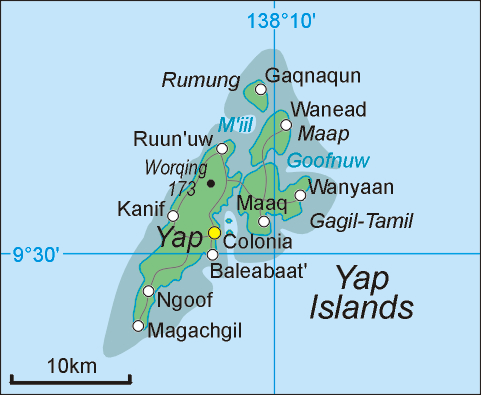 The Yap Islands can be found in the far western portion of the Federated States. Yap Island is part of the Federated States of Micronesia. With a total surface of 271 square miles, the land area of the entire Federated States represents about four times the size of Washington, DC. Yap Islanders use stone and shells as currency, or more specifically, as an “exchange valuable” (Fitzpatrick 2003:67). Yap stone money discs take the shape of a donut. They range in size from small (measuring just a few inches in diameter) to enormous (12 ft in diameter, 1.5 ft thick and weighing 8,800 lbs). The origin of these stone discs remains murky. 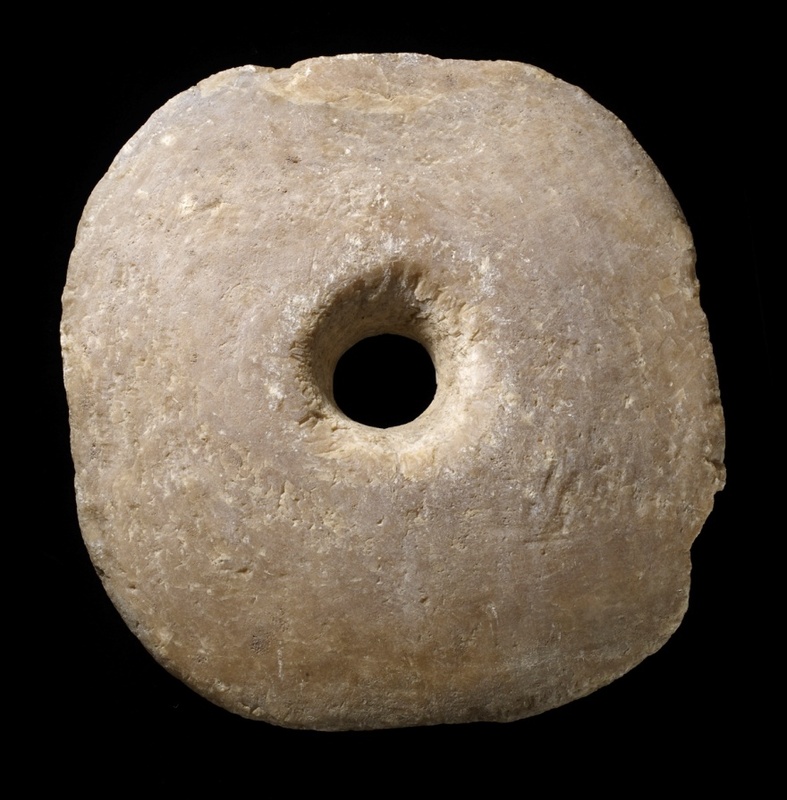 Some researchers have suggested that the earliest stones, alleged to have been very small, might have imitated stone or shell beads (Fitzpatrick 2003:68). The intrinsic value of such a Rai stone, as they are known among the locals, is based on the effort that went into quarrying it, the quality of its finish, and its history. The latter is important, if not a bit morbid. If it is known that a person lost his life while bringing the stone back to Yap, then the value of that stone increased (Fitzpatrick 2002:229; 2003: 77-79). You read this right: they brought the stones back to Yap. The stone used to make these money discs does not come from Yap Island. Rai stones were made from limestone (Fitzpatrick 2003:68, 116-124) from the islands of Palau, located 280 miles southwest of Yap Island. To a lesser degree, the Yapese also traveled in the opposite direction, to Guam, to quarry stone money (Fitzpatrick 2003:70). This was quite a feat. How was this done? Palau Islands and their location in the Pacific. Excavations and radiocarbon dates have revealed that the quarrying activity took place in Palau (Fitzpatrick, 2002: 227, 239) at least several hundred years prior to European contact; it intensified shortly thereafter. About ten quarries in Palau from which the Yap islanders extracted their stone money have been recorded; more remain to be investigated (Fitzpatrick, 2003:8). One of these localities was Omis cave. It contained several unfinished money discs (Fitzpatrick, 2003: 138-160). Radiocarbon dates suggest that work in this cave was carried out during the historic period, going back around two to three centuries ago (Fitzpatrick, 2003: 159). Work done by archaeologists in 1999 and 2000 identified at least 15 stone money discs in various stages of production in the vicinity of four quarries on the Island of Palau. Shellfish and other faunal remains were also found (Fitzpatrick, 2002: 228; Fitzpatrick, 2003:299). As far as we know, Palauans never traveled to Yap to participate in trade; instead this was a one-way trade, with Yapese setting out for Palau and returning with the much desired stone money (Fitzpatrick, 2003: 6, 40). Imagine setting out in your outrigger canoe to travel from Yap Island to Palau to mine stones and shape them into the stone donuts we have come to know. This process involved several stages (Fitzpatrick, 2003: 295-297). 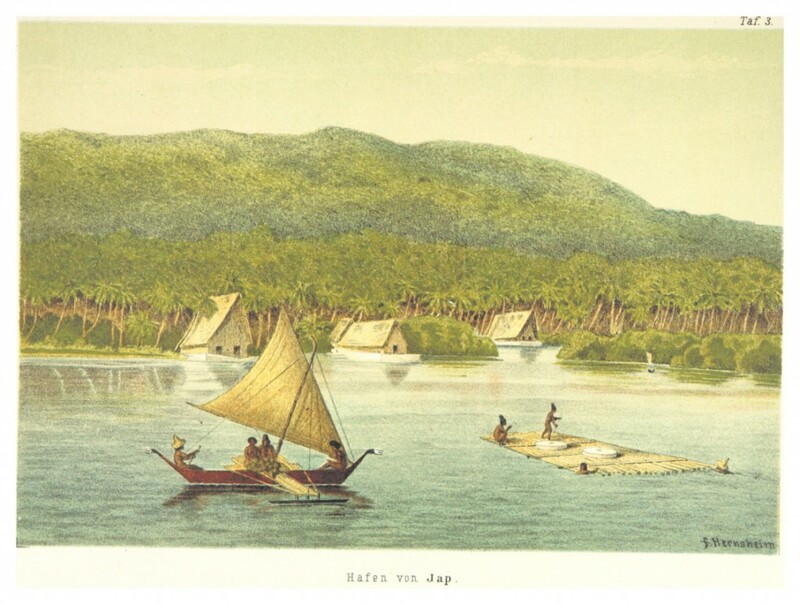 Selecting the quarry: Yapese workers had to obtain permission from Palauan chiefs to quarry. Once they did, they would select a cave or rock shelter along the coast. Perform carving: upon selecting a suitable deposit of limestone, a general shape was “roughed out.” This was done in situ, meaning the blocks were not hauled off to another area to be transformed. Detailed carving: Yapese workers used gouges and chisels to create a flat and smooth surface. The disc was probably removed from the limestone deposit during or after this stage. Abrasion/flattening: after the shape of the disc was complete, the surface was further flattened using a chisel made from shell, stone or iron. Perforation: the disc was then perforated in the center. Oral traditions tell us this was initially done with coral and a fire drill. Later, iron tools were used. Polishing: this represents the final stage of the process. The use of an abrader, such as pumice, mixed with water resulted in a smooth finish of the stone’s surface. Getting to Palau was one thing, returning with a heavy stone disc must have been quite an experience. First they would have to be brought down to the water’s edge. This is where the hole in the center comes in handy: a sturdy wooden pole would enable porters to lift it and move it to the beach. Logistics of moving Yap money around. Note the wooden poles sticking through the stones. 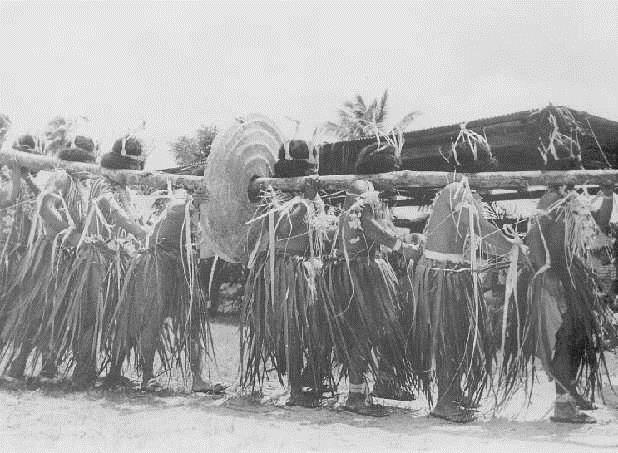 At least three modes of transportation were used to get the stone discs from Palau to Yap. The first form of transportation involved the traditional watercraft in this part of the world, a canoe, or two canoes in the case of a large stone. A late 19th century account relates that the stones had “a large hole in the centre through which a log is passed and this, when laid across two canoes, is sufficient to support the stone in transit.” (Le Hunte, 1883:25). Another approach seems to have been to fill the canoes with water, then load the disc and bail out the water (Fitzpatrick, 2003:311). A second way of moving the stones involved rafts (Fitzpatrick, 2003: 310-311). A late 19th century illustration depicts a set of Rai money discs resting on a raft. Oral traditions on Yap mention how an early Yapese navigator was caught in a typhoon as he was trying to return home with several stones. We learn that the typhoon “[s]plit the canoes into pieces, and some of the rafts carrying the stones sank, and other rafts were separated from the canoes. But Anguman [the navigator] was able to bring some pieces on his rafts trailing after his canoes” (Fitzpatrick, 2003:73-74). Investigations close to Omis Cave have revealed the presence a dock at the entrance to the cave. At high tide, the dock is almost fully submerged; at low tide, it is fully exposed. This would have “facilitated the loading of stone money onto watercraft. Rafts could be placed on or adjacent to the dock at low tide and discs moved or rolled on top and secured. At high tide the raft could then be maneuvered out of the shallow lagoon into the deeper channel for eventual transport back to Yap” (Fitzpatrick, 2003:146). Not all stone discs made it to their destination. Some found a watery resting place. Modern divers have encountered many sunken stone discs in the waters of these islands; there must be many more resting on the bottom of the ocean. A third form of hauling the stone money was with European ships (Fitzpatrick, 2002: 228; 2003:311-312). This form of transportation allowed many more stones to be shipped safely to Yap. By the late 1800s Yap was inundated with stone money. 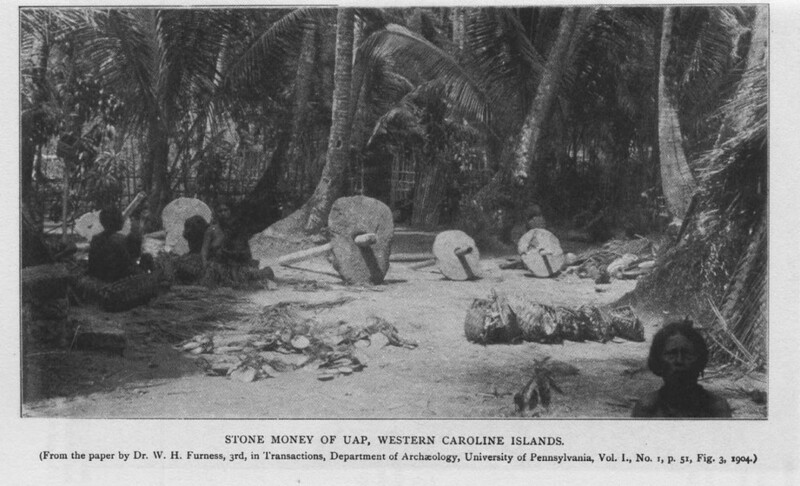 The Yap islanders paid for these stones with copra (Fitzpatrick 2003:101). The Japanese counted over 13,000 disks during their administration in the 1930s. Typhoons, flooding, and the use of these stones as anchors and construction materials during WWII cut this number in half (Fitzpatrick 2002:229; 2003:111). Transport by canoe and rafts depended on prevailing trade winds and open ocean currents. The best time to transport discs from Palau to Yap would have been between late April and the beginning of October. The ideal time for Yapese workers to come to Palau to prepare a load of money discs would therefore have been from September to February (Fitzpatrick, 2003:311 – 312). Just in case you are wondering, the US dollar is now the common currency in Yap. The last stone disc was carved and brought to Yap in 1931 (Fitzpatrick 2003:111-112). From that moment on, the US dollar replaced it as commonly used currency. However, stone money is still used to this day for major transactions like payment of dowry or purchase of land. Moreover, small pre-contact discs are considered more valuable than larger post-contact discs (Fitzpatrick, 2003:302). Because of their size and weight, the largest stones have not moved since the day they were brought ashore in Yap. We find them lining roads, propped up in front of a house, or standing in someone’s backyard. When transactions involving Rai money occur, ownership of the stone is transferred, but the stone itself does not move. People just know that someone else now owns it. Old currency proudly remembered on modern license plate on Yap Island. More prevalent and much easier to transport are the images of Rai money. As a symbol of Yap Island, they can be found on the island’s license plates. Speaking of the stone money being a national symbol, one stone disc was presented on the inauguration of the Federated States of Micronesia (July 12, 1978). Presentation of Yapese stone money for FSM (Federated States of Micronesia) inauguration. Today they help draw and entertain tourists. On Yap Day, March 1st and 2nd (sic), strong island men carry “small change” around, much to the delight of assembled tourists. Speaking of small change, the Houston Museum of Natural Science also has a small (but still heavy) example of this Rai money. Much smaller and rarer than Rai money is Yapese shell currency. In earlier days, shell money served as small change. Two kinds of shell money existed: the mother-of-pearl (yar) and non-native Spondylus shell (gau) (Fitzpatrick, 2002: 228; 2003:7). Fitzpatrick, Scott M., 2002. A Radiocarbon Chronology of Yapese Stone Money Quarries in Palau. Micronesica 34(2):227-242. [link]. 2003. Stones of the Butterfly: An Archaeological Investigation of Yapese Stony Money Quarries in Palau, Western Caroline Islands, Micronesia. Ph.D. Dissertation, Department of Anthropology, University of Oregon. [link]. Le Hunte, J.R., 1883. Report of HMS Espiegle to Sir G.W. Des Voeux, Acting High Commissioner for the Western Pacific, 10 October 1883. General Proceedings (1-83). Central Archives of Fiji and the Western Pacific, Suva: Fiji.